Murcia or Costa Calida (Warm Coast) lies in the South East corner of Spain between Andalucia and Valencia, Murcia has a relaxed atmosphere and the locals believe the most important thing is to enjoy life. The province has over 170km of coastline dotted with wonderful beaches in addition to the largest salt-water lagoon in Europe (the Mar Menor), ideal for family bathing as the water here is calm and shallow and 5 degrees warmer than the rest of the Mediterranean. Murcia enjoys more than 3,000 hours of sunshine a year and the winters are pleasantly mild and dry. On the coast you can enjoy the stunning cliffs, endless white sandy beaches, pretty ports and undiscovered coves with crystal clear water; the beautiful and historic towns of Alhama, Lorca and Murcia are all well worth a visit if time permits as are the numerous attractive villages that dot the Costa Calida countryside as well as the impressive landscape of the Sierra de Espuña mountains. Apart from the excellent beaches, there are many other attractions in this area and Murcia has a rich history. Declared an historic-artistic site in 1964, Lorca is known as the 'baroque city' because of the significant architectural legacy of this style standing in its historic centre. From the Paleolithic period until Roman times, a wide variety of cultures and settlers converged in the town of Lorca and testimony to this are the great many archaeological sites, the Milaria Column from the Roman age, the Tower of Espolan or the Alfonsina Tower, among others. 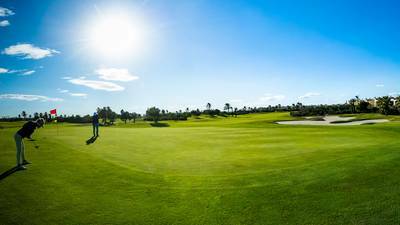 Murcia is famous for its beautiful golf courses, stretched out under warm, blue skies; Murcia truly is a golfers’ paradise. 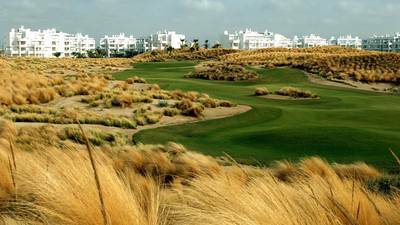 If you enjoy playing Golf in Spain then you will enjoy Murcia, as it is fast becoming one of the best Golf destinations in Europe. 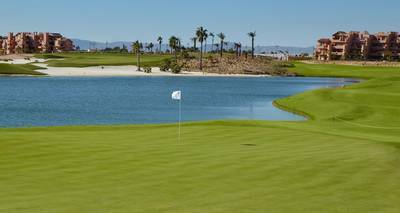 Everyone who wants to get pleasure from some of the most beautiful championship courses in Spain, with the most spectacular panorama and magnificent warm climate all year round, then Murcia is the place for them. Book your golf tee times in Murcia with Justteetimes.com, your one stop source for online golf tee times and green fees anywhere.